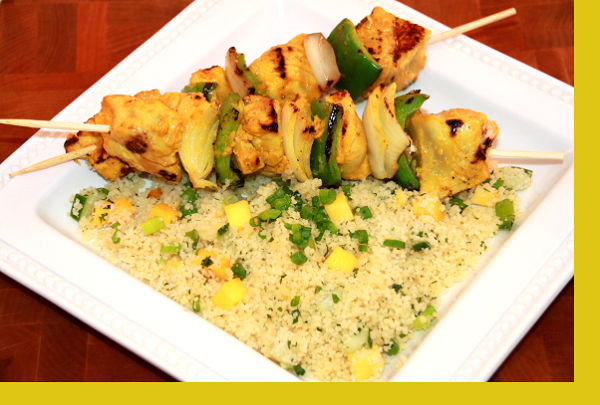 Succulent chicken kebabs in an Asian satay marinade served with mango cucumber couscous and peanut dipping sauce. Sweet and savory flavors come together for Texas big flavor! Preheat Grill. Grill kebabs for about 6 minutes per side. Reheat couscous and mix in mango cucumber dressing. Microwave peanut dipping sauce and serve. Very nice flavors all around. 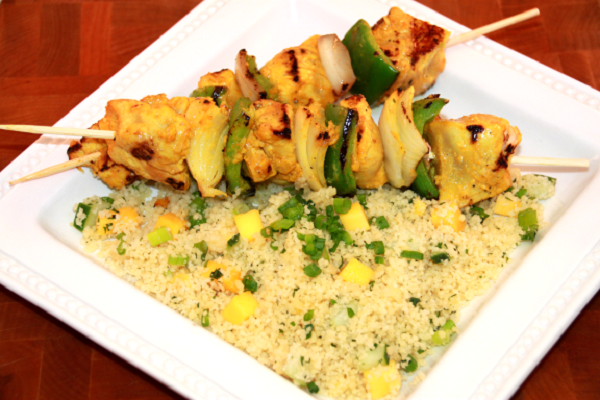 The green mix went well with the couscous The chicken skewers were delicious. The peanut sauce always enhances everything. This was not our favorite item we've ordered, but I did appreciate how the processing folks paid attention to the preferences we submitted with the order. To us, the couscous was just so/so. It seemed bland The chicken had good flavor, but we were not able to use the peanut sauce because I put it in the microwave using the provided container and it melted. The aroma, the tender chicken cubes and the peanut sauce make this our favorite. We bake it as we haven't a grill and it's so tender and succulent. We spoon a little of the peanut sauce on it as it cooks. All I'd add is naan bread! The Chicken Satay was easy to prepare. One word to describe the taste,.... MAGNIFICENT!!! So easy to make and so much flavor we will be ordering these again! We loved the satay and peanut sauce. We also loved the toppings for the couscous. But next time we would put the toppings in rice. Couscous was not our favorite.